SYDNEY—Australia’s Qantas Airways Ltd and Air New Zealand announced a codeshare deal on Friday, amid a redrawing of airline alliances in the region as booming tourism lifts carriers on both sides of the Tasman Sea to record profits. The agreement covers 115 domestic routes in both countries, but not the trans-Tasman route where the respective flag carriers compete. It comes as domestic revenues fuelled by fare hikes are driving profits, dividends and stock prices skyward. Both carriers have been cruising as international tourist numbers touch all-time highs and further stimulate domestic travel by catching internal flights – markets where the pair are entrenched – in both countries. Qantas soared to a record profit in February, while Air New Zealand said it was headed for its second-highest annual profit ever. The tie up also marks a shift in airline alliances as both Qantas and Air New Zealand have dropped or redrawn deals with Gulf carriers in recent months. 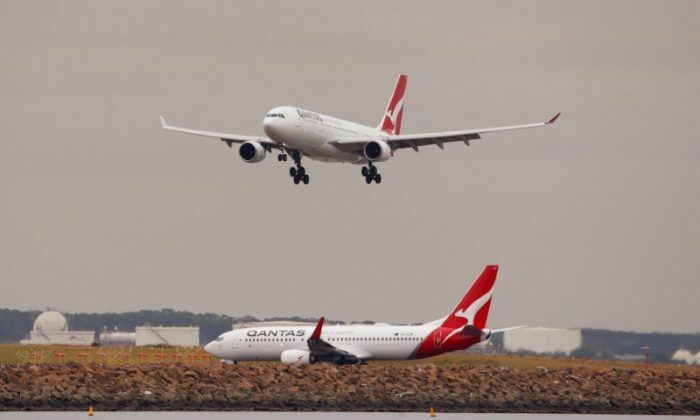 Qantas last year said it would drop flights to Emirates’ Dubai hub and re-establish its popular Singapore stopover for European flights, while Air New Zealand has ended at 7-year alliance with Virgin Australia Holdings. It will likely cost Virgin domestic customers in Australia, since passengers flying in with Air New Zealand would now be more likely to stick with its new codeshare partner, Sondal Bensan, an analyst at Qantas’ biggest shareholder, BT Investment Management, wrote in an email. “Good for Qantas, bad for Virgin,” he added. Virgin was not immediately available for comment. Air New Zealand shares were 4.5 percent higher at noon in New Zealand and Qantas shares were almost 1 percent higher in Australia, as both markets fell on Friday. Virgin shares, which are thinly traded and tightly held, dropped 4.4 percent.